Throw the perfect festive Super Bowl party, Football party or tailgating party with this yummy, zesty Velveeta Queso Dip Recipe! 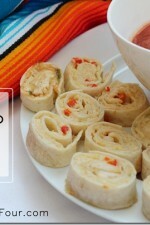 Perfect appetizer or snack idea for movie nights too! So who’s ready for Superbowl? Not only do I love watching the game and the exciting half time show, I really love the fun commercials too… and of course the ‘big game’ food! In our house there is no such thing as watching a football game without a yummy dip! 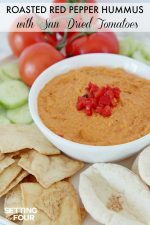 Today I’m sharing a delicious Vegetable RO*TEL and VELVEETA Queso Dip and a fun ‘Party Ready’ Queso table spread! This a sponsored post written by me on behalf of RO*TEL & VELVEETA for IZEA. All opinions are 100% mine. Zesty, creamy, tasty, and easy – this Queso dip made with RO*TEL and VELVEETA is a real crowd pleaser! Queso is a quick, easy and zesty recipe with just two ingredients, VELVEETA and RO*TEL. This recipe is the perfect addition to any occasion’s entertainment spread! I switched it up a bit with some veggie Add-Ins, diced onion and celery! A delicious creamy zesty queso dip appetizer! Combine undrained Ro*Tel® tomatoes and Velveeta in medium microwave-safe dish, cover with a paper towel. Microwave on High for 3 minutes and stir. Microwave 3 more minutes or until Velveeta is completely melted. Serve warm as a dip with tortilla chips, crackers and cut-up fresh vegetables. 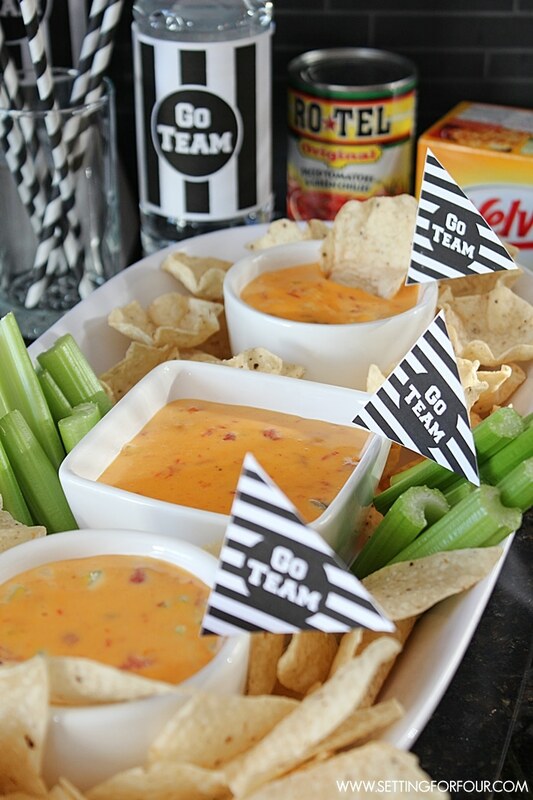 I created this fun Queso spread using these fabulous football printables, including bottle wrappers, flag toothpick toppers and mini bunting. This snack display took very little time to set up – which is perfect because you don’t want to miss the game or those amazing Superbowl commercials! 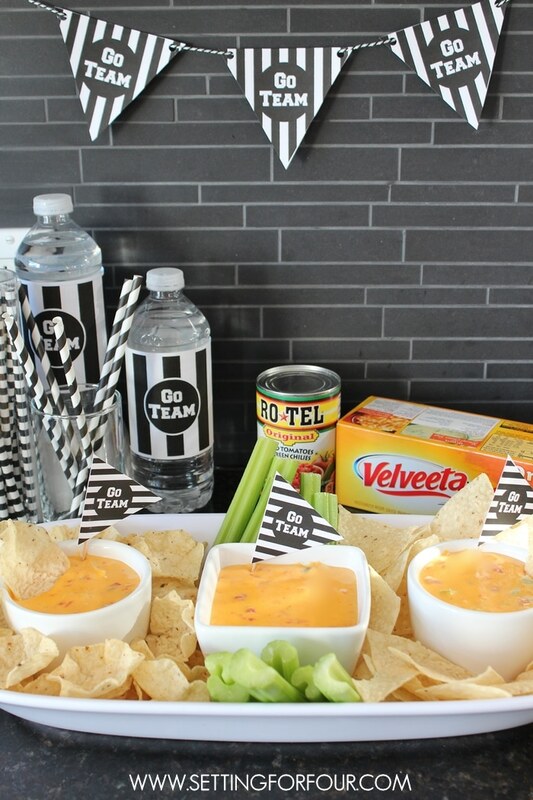 Whether you are watching the game from the comfort of your couch or celebrating with a tailgating party the combination of RO*TEL and VELVEETA make a Queso dip that is so good it will be the star of your ‘big game’ spread. 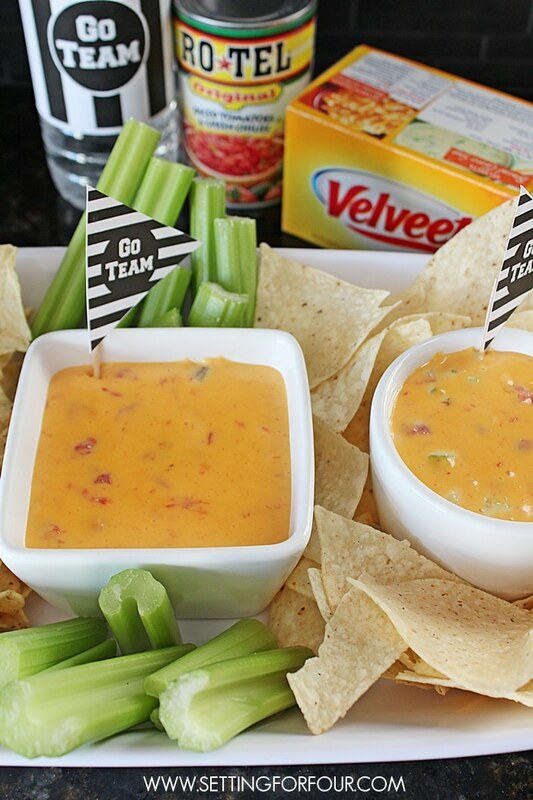 Enjoy the upcoming big game and this yummy Vegetable VELVEETA and RO*TEL Queso! Yay – I’m glad you love this queso recipe too Sarah! 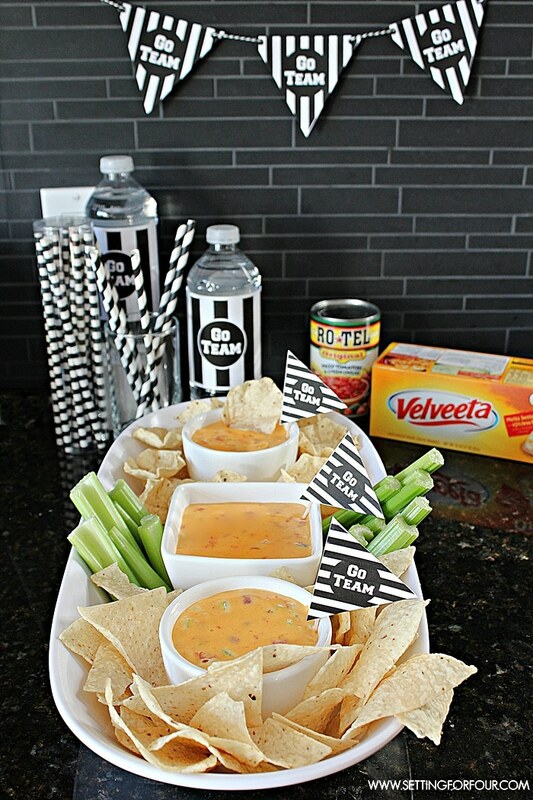 I LOVE how you used my free Super Bowl printables… SO fun!! I just posted my Velveeta and Rotel queso dip recipe too. Love how easy and simple it is to make! 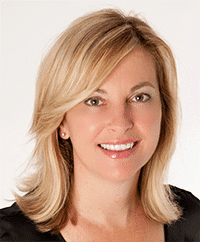 I LOVE your free Superbowl printables Laura! The black and white color is so me!! 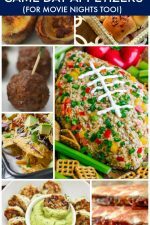 Everyone needs to run over to your blog – Make Life Lovely – to get them for their Superbowl party! We love queso. Many years ago my mom taught me how to use rotel in a chicken casserole served with tortilla chips. Our family loves it. Oh that sounds yummy – Rotel in a chicken casserole!! Thanks for sharing that Nancy! Love this! Make it all the time – it’s so yummy. 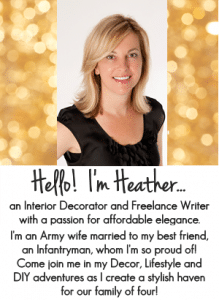 I agree – it’s so delish and easy to whip up Heather! Sounds delicious! I’ve never had rotel before, but I’d like to try it! It’s so easy to whip up Amy! You’ll love it! This looks so cute and yummy! Love Ro Tel. Yum! Thanks Kristin – it really is so yummy! I’ll be eating it this Sunday for the big game – I hope there are no deflated balls to have to worry about! Oh my word this looks delicious! I’ve never made queso dip before. I’m going to pick up the ingredients for this when I go shopping tomorrow for the game on Sunday. I think my family and I could eat this for breakfast, lunch and dinner! LOL Malia- mine too – we love our dips and this queso dip is so yummy! This looks SO DELICIOUS! Perfect for Sunday! 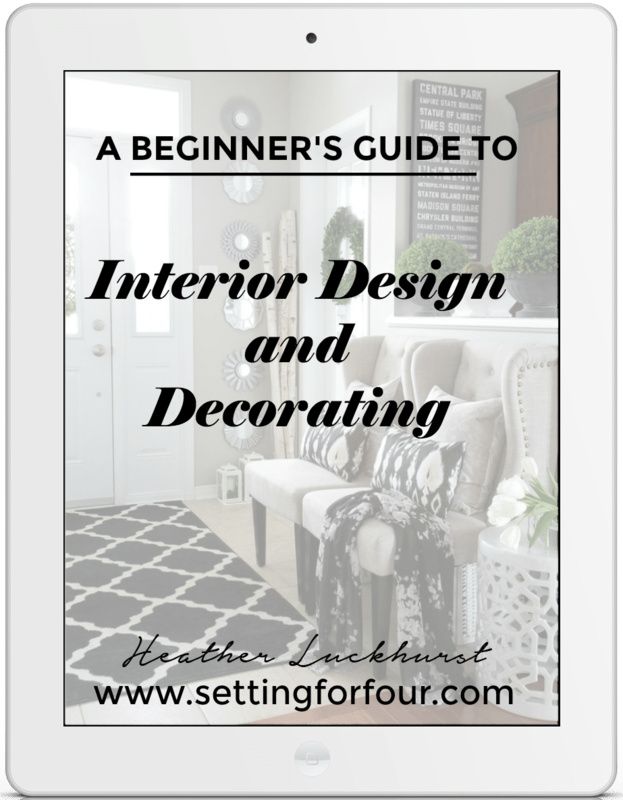 Heather… this looks so quick and easy!! Off to pin it!! As far as I’m concerned, Velveeta and Rotel are the most perfect dip on the planet. My mom made it for us when we were little and I still love! You are so right Amy – it’s a classic dip that’s just so perfect it never goes out of style! Well I know what I am making for our next party! Looks delish Heather. 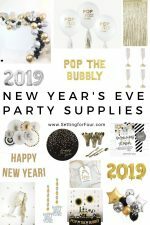 Yes – it’s a great addition to any party!! I’m glad you like it Debbie!